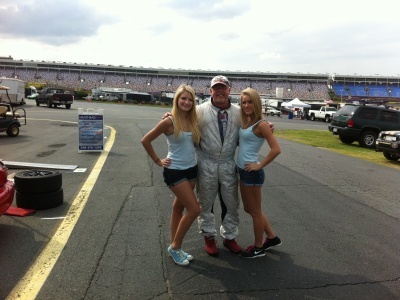 The Mid-Atlantic Road Racing Series (MARRS) held its tenth and eleventh regional SCCA Club Racing events of the 2012 season on Saturday August 18th and Sunday August 19th at Charlotte Motor Speedway in Charlotte, NC. Of the three Cahall brothers, only Ted Cahall raced at the epic Charlotte Motor Speedway for MARRS 10 & 11. Ted was joined by his racing coach, Todd Lamb, as well as Glenn Murphey as crew chief. Ted dropped the SM5 class races in favor of focusing only on the Spec Miata car in the SM and STL classes. On Sunday, Ted posted his first MARRS SM class podium finish by taking 3rd place! He did not race in the STL class so he could reserve his energy and focus on SM. He set his "personal best" fastest lap at Charlotte Motor Speedway in that race with a 1:27.9. Not too shabby for his first time at the track. It was helpful to be able to bump draft with Todd, but the best racers are always working the draft.